CHARLOTTE, N.C. - April 20, 2018 - PRLog -- The House of Enix (THOE), a 501(c)(3) non-profit organization, supported by SpiceLAB Media have joined forces to create A Night of Giving. The purpose of A Night of Giving is to highlight and support the restoration of the Siloam Schoolhouse. This inaugural fundraising event will serve as the kick-off of a 6 month fundraising campaign. 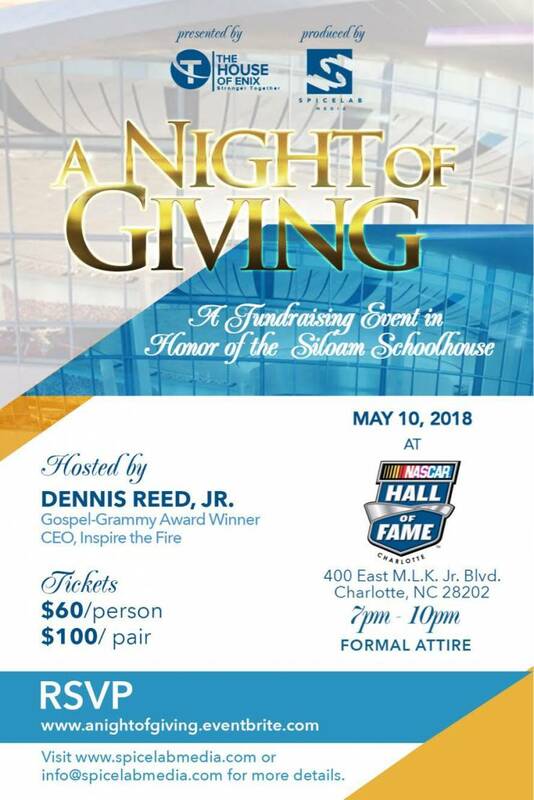 A Night of Giving will be held at the NASCAR Hall of Fame, located in Uptown Charlotte on May 10, 2018 from 7- 10 PM. The evening will be hosted by Grammy Award winner Dennis Reed, Jr., Founder/CEO of Inspire the Fire. Guests, who will include sponsors, individuals, community leaders, celebrities, organizations and institutions will enjoy live music, entertainment and a sumptuous culinary experience. In addition, attendees will have exclusive access to tour the expansively exquisite Great Hall at the venue. The House of Enix was created by Lu-Ann Barry to serve as a platform to bring more visibility to non-profits that may not have a larger presence in the community, but serves the community immensely. THOE has picked up the challenge to affect change by way of the community and beyond in their endeavor to assist in the restoration of the historic Siloam Schoolhouse, located in Northeast Charlotte. Throughout the South, it was one of thousands of schools built in the early 20th century to educate African Americans. In addition, the historic school is on the National Register of Historic Places. Its sustainability is currently threatened and at risk due to its state of disrepair. The school has a legacy of having a profound impact on the lives of many children during the Jim Crow era as well it is part of the Rosenwald School movement. The objective is to restore the structure, so it can continue to function as a social hub for the community and educational resource center. All donor funding and individual giving are tax deductible. Once restoration is complete, the building will become a permanent exhibit on the history of African Americans in the Charlotte Mecklenburg region, placing that history in a national context. As it has been said, it took a community to build the school, it will take the community to save it. When asked about the importance of A Night of Giving and how she is looking forward to the inaugural event, Barry states "A Night of Giving is representative of preserving history and making history. Through the Siloam Schoolhouse project, it has made me aware that not only are we working to help maintain a legacy but it has awaken my inner spirit to recognize we all, individually, are creating our own legacies. The 6-month fundraising campaign being launched by The House of Enix is to help aid the Charlotte Museum of History in bringing awareness to this initiative as well as to help aid other everyday "legends" within the community. By creating this campaign, I hope that each person we connect to, walks away more enlightened to what their own legacy will looklike." For more information and to purchase tickets to A Night of Giving, please visit www.anightofgiving.eventbrite.com and for information on how you may be able to support the non-profit by becoming a donor , please email: info@spicelabmedia.com. To apply for media credentials or to request an interview with the Founder, Lu-Ann Barry, send inquiries to Candice@CandiceNicolePR.com. To keep up with SpiceLAB Media on Social Media, please "LIKE" the Facebook page via Spice Lab Media LLC and follow @SpiceLab on Instagram. The House of Enix was founded by Lu-Ann Barry and is a registered IRS sanctioned section 501(c)(3) not for profit organization, committed to uphold unity in the community with integrity. It offers a new generation of leaders a close look at the people, institutions and the processes that shape public awareness. The organization's focus is on creating platforms for raising consciousness and a stage from which we can conduct awareness campaigns in the Charlotte area and beyond.